Perhaps you’ve watched a team of rowers glide their slender craft across the water—in harmony with each other, their boat, the water, and the sky—and maybe you’ve felt a twinge of envy. Good news: You are never too old to row, and you couldn’t live in a better place than the Pacific Northwest to learn the sport. Dozens of rowing clubs in the Puget Sound region offer masters rowing programs. (Masters means they’re for adults, rather than younger rowers.) 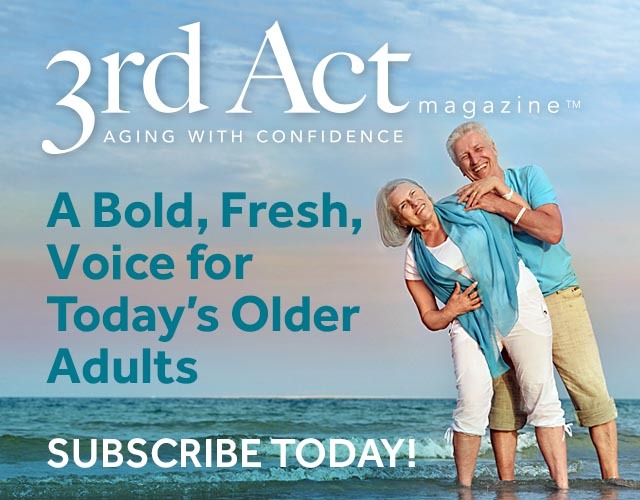 Visit any one of them and you’ll meet women in their 60s, 70s, and beyond—many who had never before pursued athletics—who are enjoying newfound physical strength, flexibility, and balance, as well as mental, emotional, and social benefits both on and off the water. Rowing is easy on the joints, it’s a terrific cardiovascular workout, and it engages every major muscle group in the body. It’s a misconception that rowing requires tremendous upper body strength. About 60 percent of the power comes from the legs, with another 20 percent from the core. And strength is only part of the equation: The sport also requires cooperation, timing, mental stamina, and technique—all skills that women do well, and ones that often improve with age. 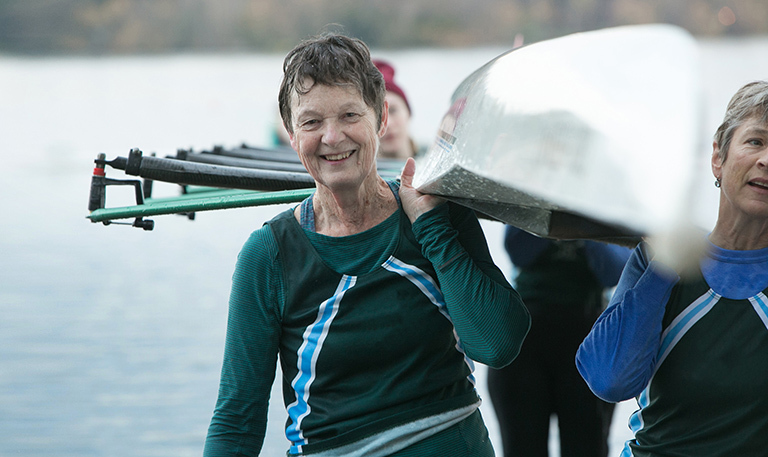 Sue Harper, 70, learned to row just six years ago. Like all women of her generation, she completed her high school and college education before federal Title IX legislation expanded athletic opportunities for women in the mid-1970s. Athletics had not been part of her life, and rowing was the first strenuous, competitive sport she ever pursued. But last year, Harper ranked number two in the world in her age group for the 1000-meter sprint on the indoor rower. It’s no surprise she reports being in the best physical shape of her life. But for Harper, who is a life coach and spiritual director, the sport brings far more than a strenuous workout. It is also “a meditation, a spiritual discipline, a practice of letting go of thoughts that aren’t relevant to the task, of breaking the habit of obsessive thinking. Your mind isn’t cluttered when you’re rowing,” she said. In winter, she and her fellow rowers attached lights to their boats and rowed before sunrise. “Rowing in the wine-dark lake, under a velvet sky, had its own kind of beauty, stillness, and quiet,” she says. Matsuo Basho, the 17th century haiku poet, once wrote that in order to paint bamboo, you must first look at the bamboo (create), then you become bamboo (understand), and finally you forget the bamboo (assimilate). Martin recalls her pottery sensei saying that each stage takes roughly 20 years, so she reckons she still has a long way to go. Several dozen rowing clubs in the Puget Sound region offer programs for masters. For a low-cost option, try the programs offered by Seattle Parks and Recreation—at Green Lake and Mt. Baker—where you’ll find excellent coaching and equipment. Teri Thomson Randall is a journalist, photographer, and filmmaker residing in Seattle. 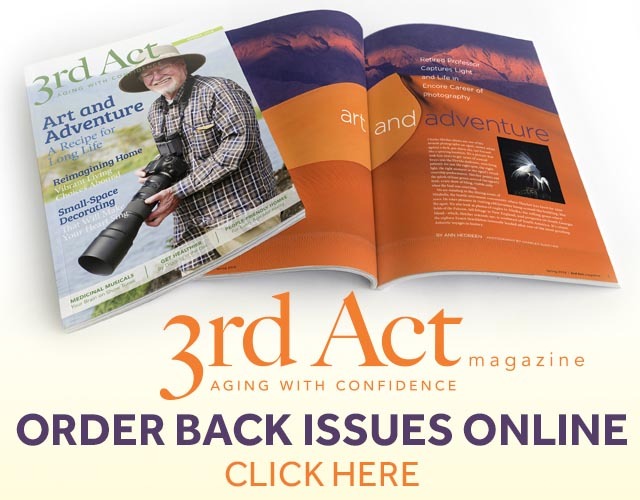 Her writing experience spans the arts and sciences, including staff writing positions at the Journal of the American Medical Association and Pasatiempo, the weekly arts magazine of the Santa Fe New Mexican. She holds graduate degrees in microbiology, science communication, and film production, and is proud to row with Green Lake Masters Crew. Other programs are available in Everett, Redmond, Kenmore, Renton, and Tacoma.